We are entering the season that begins with a smudge. That smudge is a testimony to what survives. It is a witness to what abides when everything seems lost. It is a sign that what we know and love may, for a time, be reduced to dust, but it does not disappear. We belong to the God who well knows what to do with dust, who sees the dust as a place to dream anew, who creates from it again and again. Today we begin the season of Lent. On Ash Wednesday we are reminded that we live vulnerable and fragile lives in a vulnerable and fragile world — that we came from dust and to dust we will return. And yet, as Jan Richardson writes, this “smudge” of ash is, in fact, a symbol for what remains and what abides. But the “smudge” represents even more, because, according to Richardson, “we belong to the God who well knows what to do with dust…” and to the God “who sees the dust as a place to dream anew” and dust as a place for divine re-creation. Lent is a time of remembering the God we belong to. We read in Joel 2: 2:12-13: “Yet even now, says the LORD, return to me with all your heart, with fasting, with weeping, and with mourning; rend your hearts and not your clothing. Return to the LORD, your God, for he is gracious and merciful, slow to anger, and abounding in steadfast love, and relents from punishing. Each year at Lent, I learn a little bit more how to return to God with my whole heart. One way to return with a whole heart is releasing what is illusion and distraction, and the many things, which are not mine to carry. Perhaps a spiritual practice this Lent could be to become more aware of what I am being invited to lay down each day, and pray for the courage and grace to do so. This entry was posted in Uncategorized on March 6, 2019 by ghlstn. Winter is a challenge for me — especially February. Although it’s the shortest month, February days seem to slog so slowly towards March, as if trudging through knee-deep snow or mud. On February 2nd the groundhog did not see his shadow, predicting an early spring, but I find little comfort in such forecasts. Shadow or not, by mid-February, I often begin to feel deeply sensitive to the suffering all around me, both in my own smaller circle of loved ones, and in the larger world. I feel increasingly exposed and vulnerable. My first instinct is to hibernate until spring like the groundhog we suspect spends his “winter vacations” under our deck. And I have many long conversations — more like debates 🙂 — with God about the purpose of life and suffering. God never says much but sometimes points out the magical beauty of a tree encased in ice shining in moonlight, or the sweet morning song of a Carolina wren. This year I thought I was ahead of the game. I had planned to take an online course (something fun to learn! ), saved long and luxurious books to read during dark winter evenings, bought beautifully soft and colorful yarns to create soft throws and scarves, stocked up on wonderfully fragrant candles, and had an abundance of happy family events to celebrate. Still… it happened again… With little advance notice, sorrow and suffering arrived at my heart’s doorstep, entered boldly — without permission — and scattered their belongings everywhere like unwelcome guests. Although they are frequent and familiar winter-guests, their arrival always catches me off guard. As I pray with this winter’s particular vulnerability, I’ve begun to wonder if there might be a different way of relating to unavoidable vulnerability. I do not want to live closed off – inside an armor of self-protection (if that were even possible). I understand there is suffering in life — it just is — and I want to lean in with compassion to those who are suffering, including myself. In light of all of our continuing arrivals, threshold by threshold, I share with you the following video by Carrie Newcomer, entitled “The Point of Arrival.” Just as the snowdrop flower (in the above header image) opens, step by step, to the fullness of its blossoming, so may God’s grace give us all courage to open to our truest blossoming. This entry was posted in Uncategorized on February 28, 2019 by ghlstn. Beloved poet Mary Oliver died on January 17. She was 83, and shared so many poems, and so much light with the world. It was as if, through her poetry and through her own living, she held a flashlight for us all, shining it onto all the small and ordinary details of life, illuminating a sacred shimmering presence – grace, beauty, wonder, nature being nature, human being human. In her poetry everything belonged. Through her noticing, we notice. Through her deep appreciation, we learn to see. Through her awe, we are drawn into wonder. In the broken places of my life — through all my efforts to manage, order and set strict boundaries (walls, really) — I tried my best to protect myself and others. Unwittingly, I had traded a (presumed) safety for true freedom and joy. It didn’t work. Instead, I became increasingly guarded and fearful, and pain didn’t respect the boundaries/walls I had so carefully erected against it. I encourage you to seek out some of Mary Oliver’s poetry. There is much online, and some wonderful books available. I have decided that in the coming year I will focus on her poetry and prose – to absorb her words and spirit, and learn from her. So I will probably be sharing more of my favorites here as well. I end with Mary’s three instructions:. Please feel free to share your favorite Mary Oliver poems in the “comments.” I’d love to know how her words – and other poetry – have touched your life. This entry was posted in Uncategorized on January 29, 2019 by ghlstn. As I have contemplated my “word for the year” (following the 12-day retreat with Christine Valters Paintner — see blog dated 12/30/18), I was immediately drawn to the word “wild.” This word has been living in me for 2-3 months, inviting me to a free, reverent, and more holistic way of living, exploring, playing, loving. This is very close to what I am seeking. The time has come to follow the star (planted in us by God). Certainly there is a time for seeking advice of others. But remember the wise men asking Herod where to find the “King of the Jews”: we need to be wise about who we look to for advice and wisdom. For me, the “tamed ones” are people who have compromised and/or limited their own journeys in order to feel safe and fit in with the expectations of others (which we all do to some degree at different times). Usually these “tamed” people will want us to do the same thing. They are often well-meaning. And perhaps for a while, it is the understandable choice. But now — in my mid 60’s — I feel ready to follow the star of the unique journey God has given to me. Yesterday, as I followed a guided meditation led by Christine Valters Paintner, I was invited to imagine St. Brigid of Kildare handing me a gift. It was easy for me to imagine St. Brigid: dressed in a deep green gown, her head covered by a simple scarf, with long, red, curly hair escaping wildly below. As I held out my hands, Brigid placed a compass in them. I really didn’t want a compass, and I thought I would ask her for a different gift :)… but as I looked more closely, the compass became a star, which felt mysterious, exciting and perfect. I also noticed the compass-star was a locket, which I could slip over my head and wear close to my heart. I knew that I could trust this star to guide me on this wild journey – which feels new, and yet, familiar. I believe I have always been a “wild child” but was not able to live out this truth as fully as I can now — which is total gift – and total blessing. Perhaps as you listen to the music in this video, you might consider your own star, and what you are seeking in this season of your life. Blessings on this journey we share, seeking the star — leading us to Love. This entry was posted in Uncategorized on January 9, 2019 by ghlstn. At the turning of the year, consider the new thing being born in you. What might help you to allow this new thing to emerge? This entry was posted in Uncategorized on January 3, 2019 by ghlstn. Jesus desires to give us joy. His joy! Almost every morning I check my online Enneathought, a daily insight using the Enneagram model of transformation based on nine personality types. Yesterday I read, “As a Five, you most need to learn to appreciate that life is a joy and that the universe is benevolent.” I was immediately challenged: what would it be like to live as if I really believed that “life is a joy and the universe benevolent”? How often I live guarded and cynical trying to protect myself from hurt and disappointment. I am kept from joy when I keep myself from entering life fully. For right in the midst of the most ordinary moments of my life, joy sparkles. Like Hope of Advent Week One and Peace of Week Two, Joy also comes as gift… bubbling up from a source deep within and beyond me. It seems less a transient feeling of happy thoughts, and more a Holy Truth, a Divine Attribute, which Jesus comes to share with us. I cannot create or force joy, but I can choose to see and receive. I enter into God’s joy as I choose to notice love and beauty in God’s creation. I enter joy when I am silent and still enough to hear the whispers of God in my spirit. I enter joy when I let go, and fall into LOVE. Being grateful is foundational for being more joyful. It’s as if we are a garden and moments of gratitude are the seeds that grow and sprout into joy. baking Christmas cookies (recipes handed down from my mom and her grandmother), listening to Christmas music, and chatting with a picture of my mother and brother – both now deceased – on the kitchen counter beside me. my first early-morning cup of strong, fragrant coffee, and sitting in the stillness and quiet beside our beautiful, wild, and unwieldy Christmas tree (still without lights or decorations). Set aside some time each day this week to listen to the music below, with an open heart to receive God’s gifts in this third week of Advent. You may wish to search on youtube for other versions of this beautiful hymn. There are many. But I was drawn to the dazzling winter images in this one. (You might like to click on the YouTube button to fully enjoy the lovely winter pictures). This entry was posted in Uncategorized on December 19, 2018 by ghlstn. As we end our Advent week of “Peace” I wanted to share the video/song below. It is one of my favorite Christmas carols featuring Bing Crosby and David Bowie. It was recorded from a “vintage” television special, layering the two songs: “Little Drummer Boy” and “Peace on Earth.” The music begins at 1:50 if you want to avoid the preliminary conversation. This entry was posted in Uncategorized on December 15, 2018 by ghlstn. When we think of peace, we often think of the absence of war, pain, fear, and suffering. Yet in this season of Advent, the promise of peace comes right in the middle of the darkness of our broken world, and in our broken selves. Peace is not the absence of trouble, peace is about the presence of God in whatever we encounter. Surely this is the promise of Advent. Hillesum wrote these words when it must have seemed that hatred and evil were winning. How did she find any peace within these circumstances? 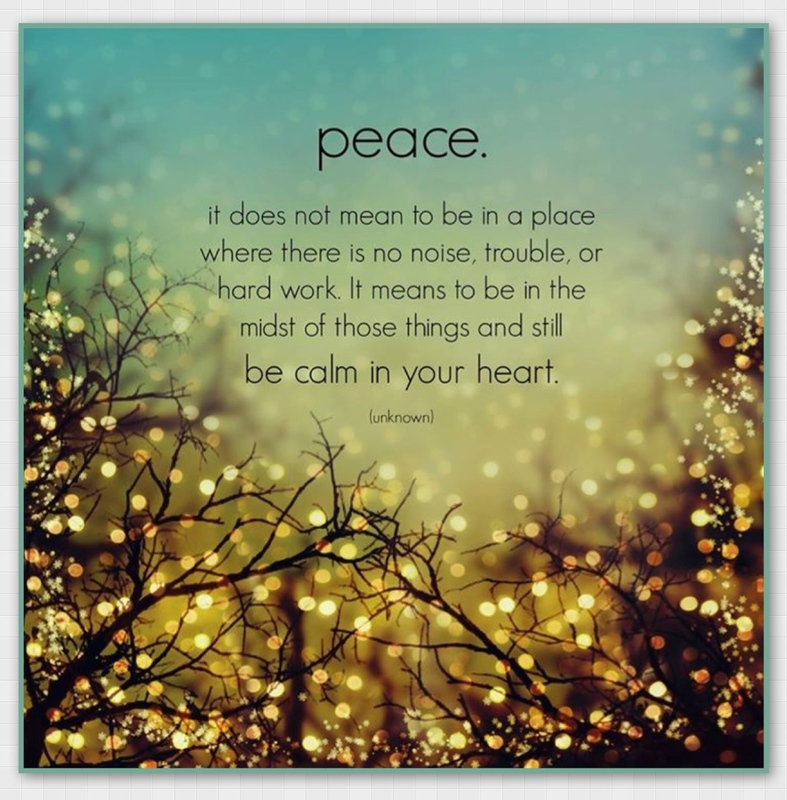 How might we claim peace in ourselves, when so much around us, and within us, is a swirling storm of emotions and events that seem to pull us into fear and despair? I am so drawn to this image of trying to quiet the ocean by pressing upon the waves. How often my arms grow weary from pressing upon the ocean waves of distraction, anxiety, fear and chaos. I too often try to resolve the uneasiness within me by trying to control the outside. Instead, the invitation from May is to dive deep within, where peace already exists. Where God is. Once we touch into this place of Peace within, we can more easily share it with the world around us. The Hebrew word for peace is Shalom, meaning “wholeness or completeness, well-being and harmony.” It means a putting back together. Like pieces of a garment, sewn together to make a whole. Or puzzle pieces gathered together — found after being lost — to fit together to make a whole picture. This is not a homogenous peace where the prerequisite for peace is that we all think or act alike, but a peace of bringing together, restoration, a renewed vision. I am only one piece of cloth — one puzzle piece — one note in a symphony, but I trust that God’s amazingly beautiful creation holds us all, needs us all. How might we practice peace this week? Perhaps we can begin with ourselves. How might we be more peaceful within ourselves, and within our families and friendships? Can we refuse to give space for criticism, judgement, toward ourselves and others? How might you spend more time in that space of peace as Gerald May writes about — the deeper place where peace simply is. Can you find peaceful places to spend a few minutes each day: perhaps outside under the stars, early in the morning watching the sunrise, taking a walk, observing a bird, listening to a favorite song. I would love for you to share where you are finding peace this Advent season. This entry was posted in Uncategorized on December 12, 2018 by ghlstn.